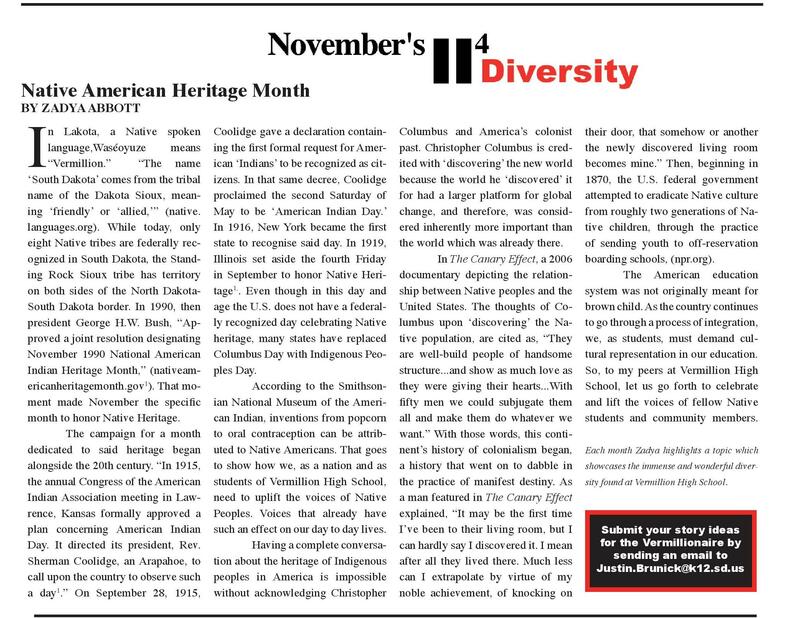 Broadcaster Press 7 December 4, 2018 www.broadcasteronline.com NOVEMBER 2018 VERMILLION.K12.SD.US VERMILLION HIGH SCHOOL’S STUDENT NEWSPAPER Native American Heritage Month I BY ZADYA ABBOTT n Lakota, a Native spoken language,WasŽoyuze means ÒVermillion.Ó ÒThe name ÔSouth DakotaÕ comes from the tribal name of the Dakota Sioux, meaning ÔfriendlyÕ or Ôallied,ÕÓ (native. languages.org). While today, only eight Native tribes are federally recognized in South Dakota, the Standing Rock Sioux tribe has territory on both sides of the North DakotaSouth Dakota border. In 1990, then president George H.W. Bush, ÒApproved a joint resolution designating November 1990 National American Indian Heritage Month,Ó (nativeamericanheritagemonth.gov1). That moment made November the specific month to honor Native Heritage. The campaign for a month dedicated to said heritage began alongside the 20th century. ÒIn 1915, the annual Congress of the American Indian Association meeting in Lawrence, Kansas formally approved a plan concerning American Indian Day. It directed its president, Rev. Sherman Coolidge, an Arapahoe, to call upon the country to observe such a day1.Ó On September 28, 1915, FALL SPORTS REVIEW BY LILLY MOCKLER & TYLER MANN TENNIS From October 4th to October 6th, the State Girls Tennis tournament for 2018 was held in Rapid City. Vermillion sent six participants who each performed in singles and doubles matches for their respective flight. In the singles, Jane Ni Struckman-Johnson ended with an overall record of 2-11 in Flight #1. Katrina Heles finished 2-9 in Flight #2, while in Flight #3 Emma Dahlhoff earned a 8-5 recorded. Lauren Mandernach competed in Flight #4, ending 2-11. Madi and Hope Schladoer partook in Flight #5 and #6, respectively finishing 2-7 and 1-6. Meanwhile, the same players also played in the doubles flights. Jane Ni Struckman-Johnson and Katrina Heles finished 1-10 in Flight #1, Emma Dahlhoff and Lauren Mandernach ended 2-7 in Flight #2, and Hope and Madi Schladoer were 0-3 in Flight #3. Overall, the team performed well. They are all looking forward to competing again next year. GOLF The Vermillion High School golf team took three qualifiers to the state tournament including Ryne Whisler, Hunter Lavin, and Willis Robertson. The state tournament was in Dell Rapids. Coolidge gave a declaration containing the first formal request for American ÔIndiansÕ to be recognized as citizens. In that same decree, Coolidge proclaimed the second Saturday of May to be ÔAmerican Indian Day.Õ In 1916, New York became the first state to recognise said day. In 1919, Illinois set aside the fourth Friday in September to honor Native Heritage1,. Even though in this day and age the U.S. does not have a federally recognized day celebrating Native heritage, many states have replaced Columbus Day with Indigenous Peoples Day. According to the Smithsonian National Museum of the American Indian, inventions from popcorn to oral contraception can be attributed to Native Americans. That goes to show how we, as a nation and as students of Vermillion High School, need to uplift the voices of Native Peoples. Voices that already have such an effect on our day to day lives. Having a complete conversation about the heritage of Indigenous peoples in America is impossible without acknowledging Christopher The boys all placed in the top 20. Ryne Whisler tied for 6th place. Hunter Lavin tied for 13th place. Willis Robertson placed 19th. CROSS COUNTRY This year, Vermillion took the boys varsity team and one girl varsity runner to state Cross Country. The qualifiers for the boys team were Justin Sorensen, Brady Martinez, Nate Bohnsack, Riley Ruhaak, Jakob Dobney and Jack Feeburg. The boys team placed 1st in their region. Taryn Whisler also qualified for state. The state qualifying meet was on October 11th in Lennox. At the state meet on October 20th, Taryn Whisler placed 6th for the varsity girls. The Boys varsity team placed 2nd overall. Justin Sorensen placed 12th, Jakob Dobney placed 17th, Riley Ruhaak finished 22nd, Brady Martinez placed 29th, Jack Freeburg finished 78th, and Nate Bohnsack placed 106th. The team did very well this year and hopes to do as well in the years to come. SOCCER Both the boysÕ and girlsÕ soccer teams reached the Class A playoffs this VHS Hosts O.I. Class A Regions BY MADDI KALLSEN O ral Interp class A regions occurred on November 13th on a Tuesday at Vermillion High School. Many different schools participated including Yankton, Elk Point, Beresford, and many other schools around the area. Categories encompass poetry, storytelling, duet, humorous, serious, and readers theatre. Brennan Stone, Nic Harris, Andrew Kronaizl, Parker Anderberg, Tessa Dooley, & Annika Holdhusen all won first place in Duet and Readers Theatre, qualifying for state, held in Watertown November 31st and December 1st. 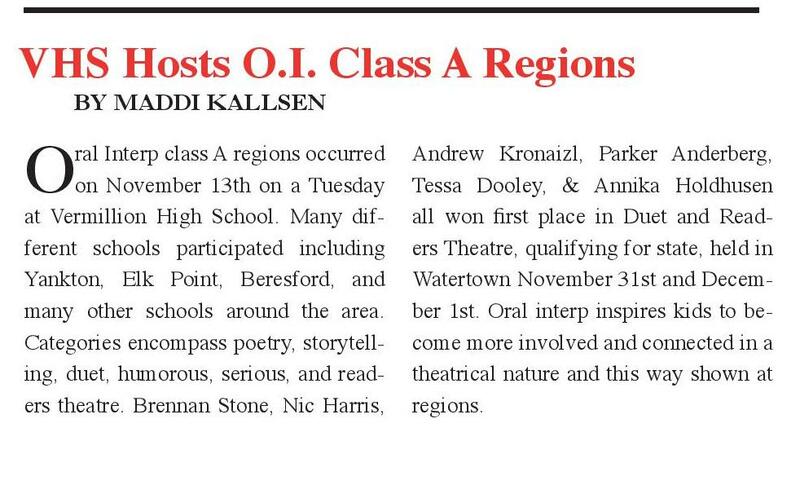 Oral interp inspires kids to become more involved and connected in a theatrical nature and this way shown at regions. Columbus and AmericaÕs colonist past. Christopher Columbus is credited with ÔdiscoveringÕ the new world because the world he ÔdiscoveredÕ it for had a larger platform for global change, and therefore, was considered inherently more important than the world which was already there. In The Canary Effect, a 2006 documentary depicting the relationship between Native peoples and the United States. The thoughts of Columbus upon ÔdiscoveringÕ the Native population, are cited as, ÒThey are well-build people of handsome structure...and show as much love as they were giving their hearts...With fifty men we could subjugate them all and make them do whatever we want.Ó With those words, this continentÕs history of colonialism began, a history that went on to dabble in the practice of manifest destiny. As a man featured in The Canary Effect explained, “It may be the first time IÕve been to their living room, but I can hardly say I discovered it. I mean after all they lived there. Much less can I extrapolate by virtue of my noble achievement, of knocking on year, ending the regular season as the #4 seed. On October 2nd, Cotton Park saw host to two home playoff games for the Tanagers. The girls played first, and they edged past #5 Garretson in a 1-0 victory. Olivia Regnerus scored the only goal of the game in the dying seconds. After that, the boys faced Belle Fourche, who were fresh off a long road trip from their hometown. The match remained scoreless at halftime, but the Tanagers ended up with a resounding 3-1 win, with goals from Andreas Lindstad, Trevor Tigert, and Wyatt Loftus. So after a pair of victories, both teams hit the road to play the top ranked Photo by Amy Sorenson Tea Titans. Unfortunately, that is where both teamsÕ seasons ended. The boys played first this time around. The hard fought match was 0-0 at the break, but Tea ended up on top, winning 2-0. The their door, that somehow or another the newly discovered living room becomes mine.Ó Then, beginning in 1870, the U.S. federal government attempted to eradicate Native culture from roughly two generations of Native children, through the practice of sending youth to off-reservation boarding schools, (npr.org). The American education system was not originally meant for brown child. As the country continues to go through a process of integration, we, as students, must demand cultural representation in our education. So, to my peers at Vermillion High School, let us go forth to celebrate and lift the voices of fellow Native students and community members. Each month Zadya highlights a topic which showcases the immense and wonderful diversity found at Vermillion High School. Submit your story ideas for the Vermillionaire by sending an email to Justin.Brunick@k12.sd.us girls game followed, and similarly, the Tanagers struggled to find the back of the net as they succumbed to a 4-0 thumbing at the feet of Tea. Both teams performed great over the course of the season, with the girls finishing with 6 wins, 4 defeats, and 2 draws. The boys ending up with a record 6 wins and 3 losses. Everyone is looking forward to next year’s season. VOLLEYBALL The girls volleyball team ended their season with a record of 6-22. The first round region game was held in Beresford. Vermillion and Beresford fought hard for the win. Beresford beat Vermillion in the end. They won three sets and Vermillion won one set. The score of the first set was 25-17 with Beresford winning. Vermillion won the second set 25-18. Beresford won the third set 25-15. The score of the final set was 25-21. All of the team members played a big role in playing hard in this regional game. Each team fought hard till the end. The winner of this game went on to the next round and had the chance to make it to the state tournament. 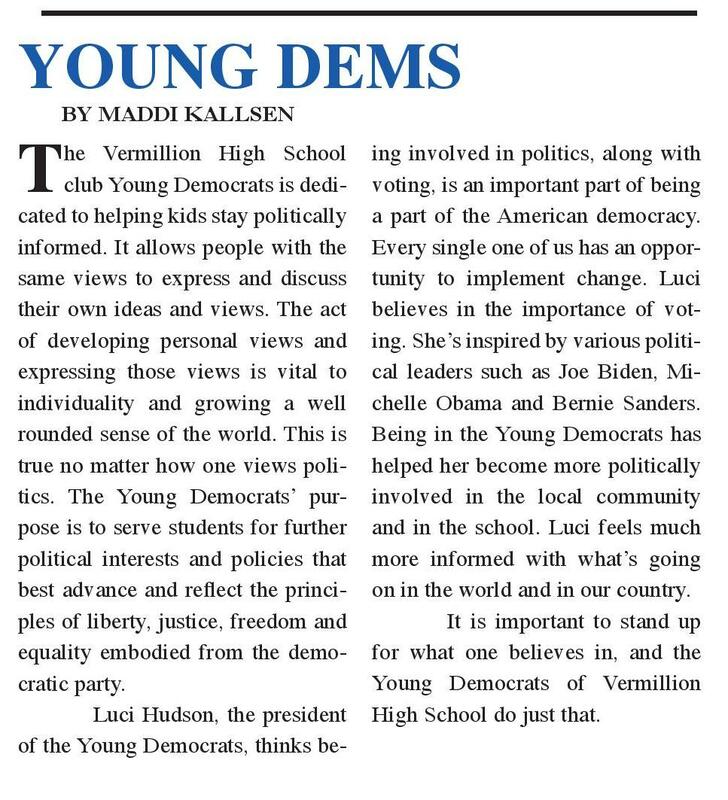 YOUNG DEMS BY MADDI KALLSEN T he Vermillion High School club Young Democrats is dedicated to helping kids stay politically informed. It allows people with the same views to express and discuss their own ideas and views. The act of developing personal views and expressing those views is vital to individuality and growing a well rounded sense of the world. This is true no matter how one views politics. The Young DemocratsÕ purpose is to serve students for further political interests and policies that best advance and reflect the principles of liberty, justice, freedom and equality embodied from the democratic party. Luci Hudson, the president of the Young Democrats, thinks be- ing involved in politics, along with voting, is an important part of being a part of the American democracy. Every single one of us has an opportunity to implement change. Luci believes in the importance of voting. SheÕs inspired by various political leaders such as Joe Biden, Michelle Obama and Bernie Sanders. Being in the Young Democrats has helped her become more politically involved in the local community and in the school. Luci feels much more informed with whatÕs going on in the world and in our country. 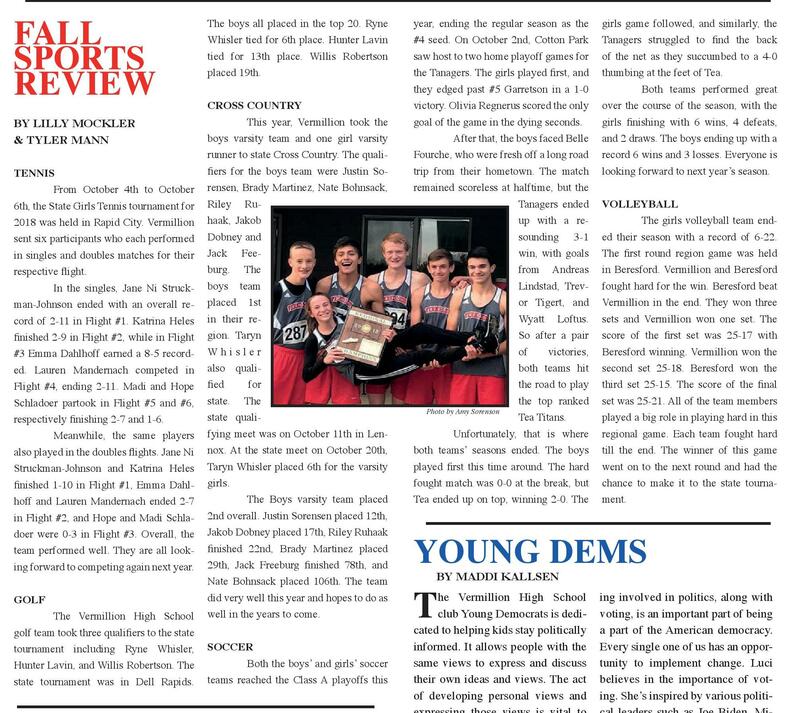 It is important to stand up for what one believes in, and the Young Democrats of Vermillion High School do just that.